It may seem that I am being master obvious but all startups need to start small. More often than not startups want to start big. Creating a very broad product that addresses the needs of a large market with a diverse set of needs. Doing this as a startup is a failing strategy. Two things yesterday reminded me of this. I went to lunch with the co-founders of SalesLoft. During lunch Kyle Porter recounted a meeting he had with Charlie Paparelli. Kyle told me that Charlie had him draw up something like the below on a white board. 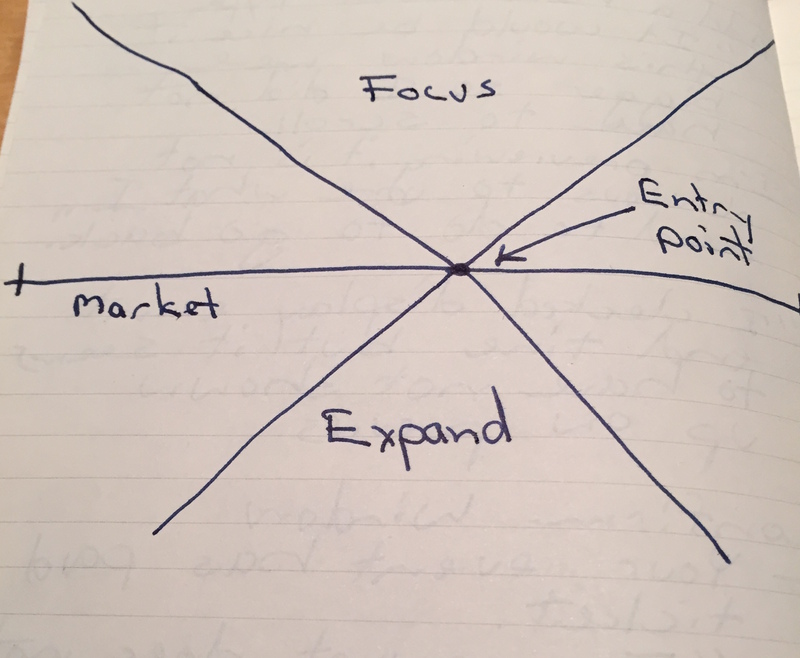 The horizontal line labeled market represents the size of the total market that a startup could address. A startup does not have the resources to address the entire market so it needs to focus. Focus on a single point in the market that is by definition small. Once you enter and control that point in the market you can expand your offers into the wider market. Last night I continued to make my way through Zero to One by Peter Thiel. I got to the point in the book where Thiel writes about building monopolies. Here is one of his thoughts on the subject. Paparelli and Thiel agree on this point and I agree with them. The best way to start a startup is to focus on a small portion of the total market with a concentrated group of initial potential customers that have the same needs that are not currently being met by any competitors.